Well, look who showed up in my garden last week. This lovely fellow is the tomato hornworm (Manduca quinquemaculata), a caterpillar that can quickly defoliate tomato plants. He’s about 4 inches long and as fat as your finger, having just munched his way through a big branch on my tomatoes. The hornworms — they get the name because of a cool-looking, stingerlike horn protruding from their back end — feed only on members of the Solanaceae or nightshade family. Tomatoes, peppers, potatoes and eggplants are the most notable vegetable members of the nightshade family, which also includes petunias, tobacco, tomatillos and Datura, among others. Hornworms are about the size of your pinky, maybe bigger, with a hornlike tail at the end. After ripping through the vegetable garden, these worms will drop into the soil and pupate for two weeks. They emerge as large moths, known as hawk or sphinx moths. This group will then deposit eggs on other nightshade plants. Those eggs will hatch, feed, drop into the soil and pupate over the winter. So each year, there are two generations of hornworms/sphinx moths. 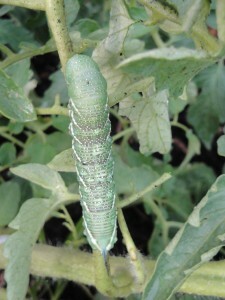 This is the first time I have found a hornworm on my plants, though I have seen the moths before. The worms’ size makes them fairly easy to spot, but the coloration helps them blend into the tomato stalks. The best control method is picking them off the plants and dropping them into soapy water to kill them. If you’d like more information, the folks at University of Minnesota Extension have an informative fact sheet on tomato hornworms. 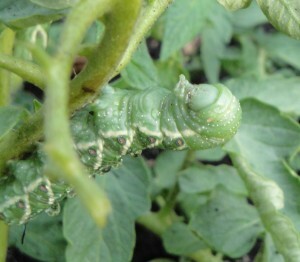 I haven’t seen this nasty hornworm yet, but I’ll keep my eyes open for these destructive little guys. 🙂 Oh and I harvested my first few cherry tomatoes. Yum!